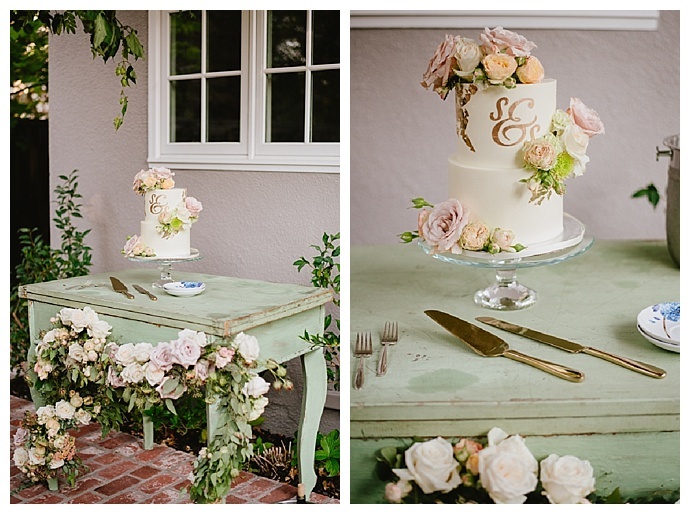 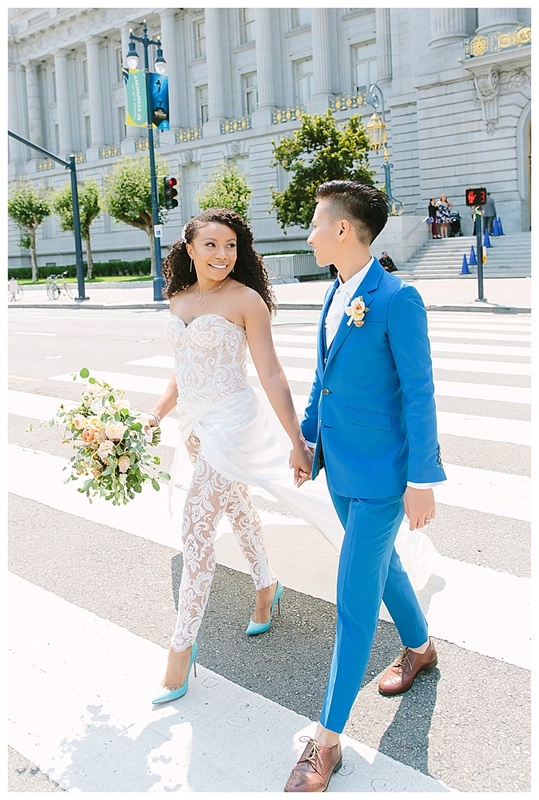 With help from Tickled Events, they began to craft a day reflective of their relationship that included a ceremony at San Francisco’s City Hall and ended with an intimate reception in a beautiful backyard filled with lush flowers where lawn games were played, drinks overflowed and tasty fare was served. 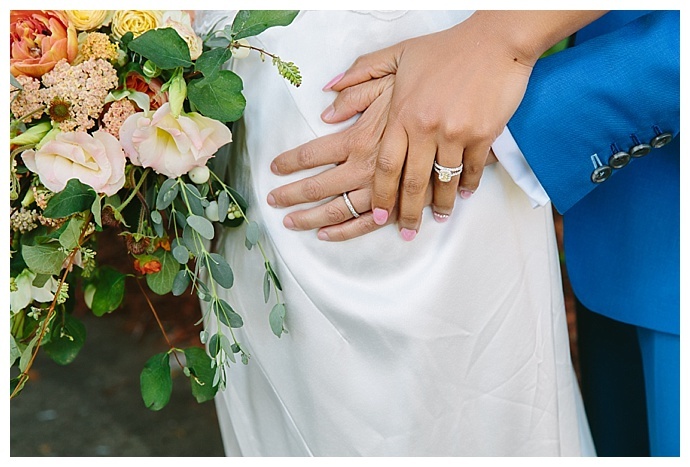 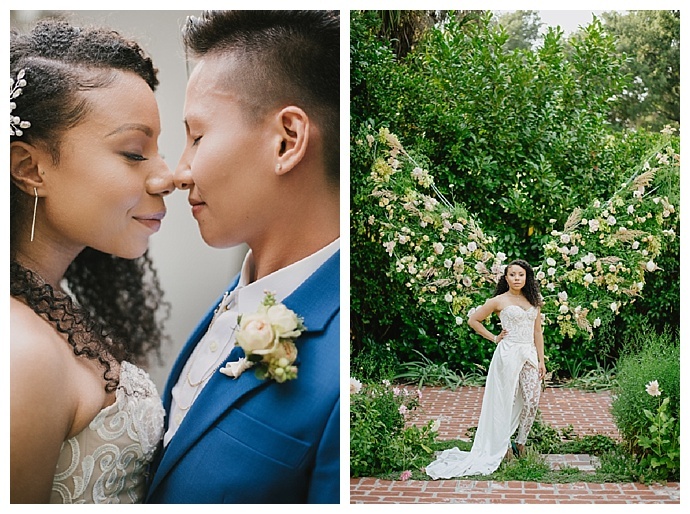 Captured by Jerry Yoon Photographers, Shalita and Sabrina’s intimate wedding makes a strong case for designing a day that’s true to you! 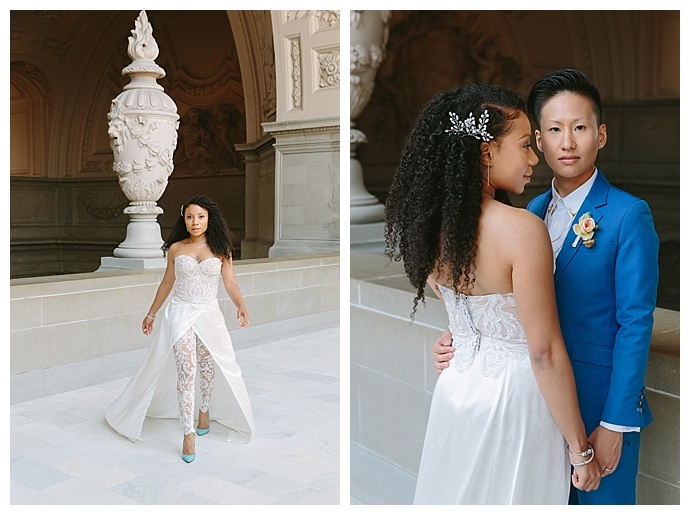 Shalita and Sabrina’s vision for a non-traditional wedding mirrored the origins of their relationship, which began with them separated by nearly 1,900 miles. 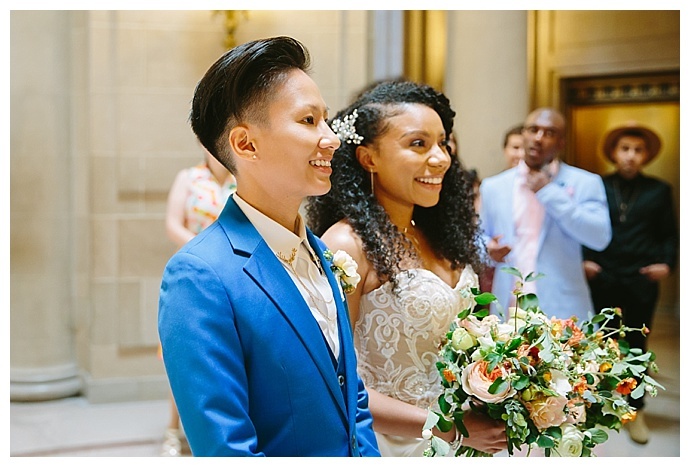 After connecting on the dating app, HER, one of the only online dating spaces specifically for queer womxn, Shalita and Sabrina had to whether long distance as Shalita was living in The Big Easy filming “NCIS: New Orleans” while Sabrina was in LA. 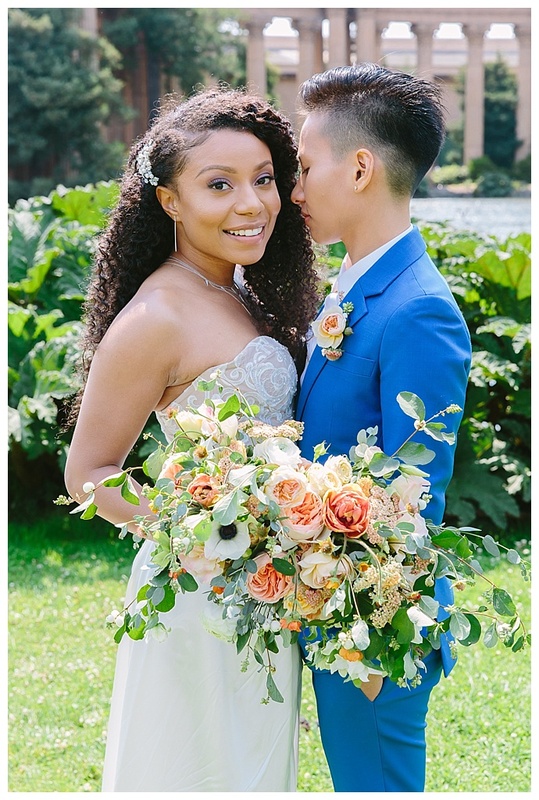 But their bond proved to be stronger than the distance that was between them, and after a year of flying back and forth to spend time together, Sabrina took the leap and moved to Louisiana. 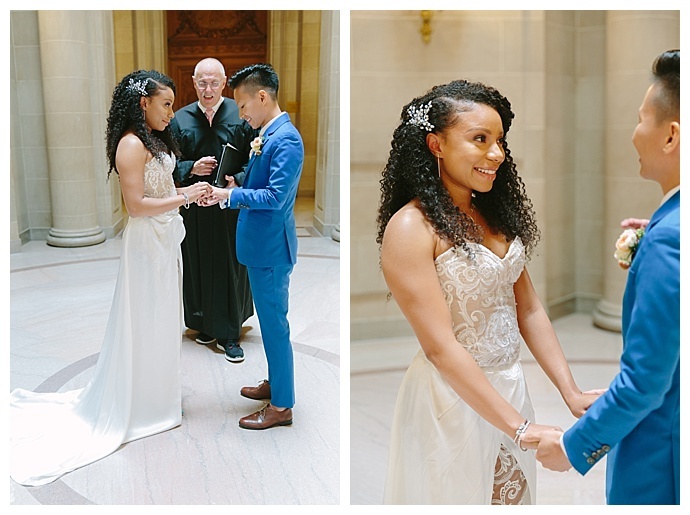 Not long after, she proposed to Shalita on a skiing and snowboarding trip in the mountains of Whistler in British Columbia with a cushion cut canary diamond ring. 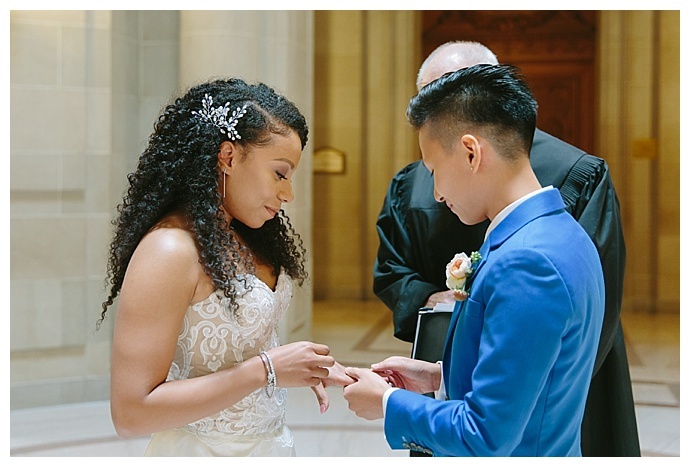 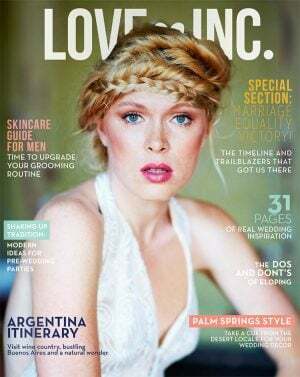 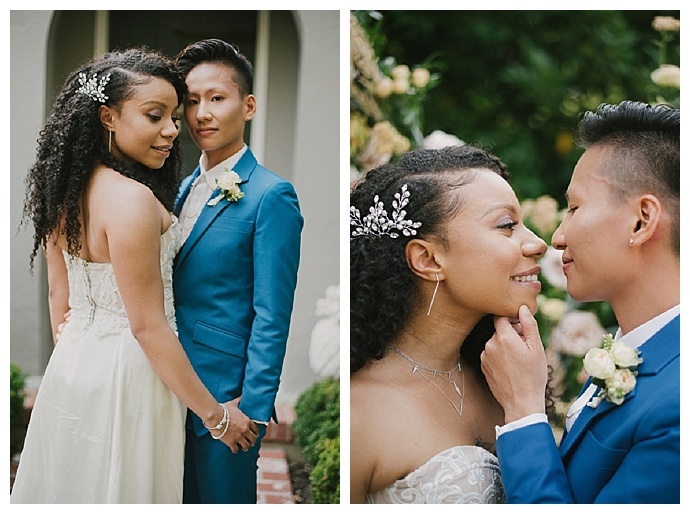 After taking some time to bask in the bliss of the newly engaged life, Shalita and Sabrina were anxious to get the next chapter of their life started, and in only two months, they pulled together a beautiful, intimate wedding that uniquely honored their relationship and included the people they love most. 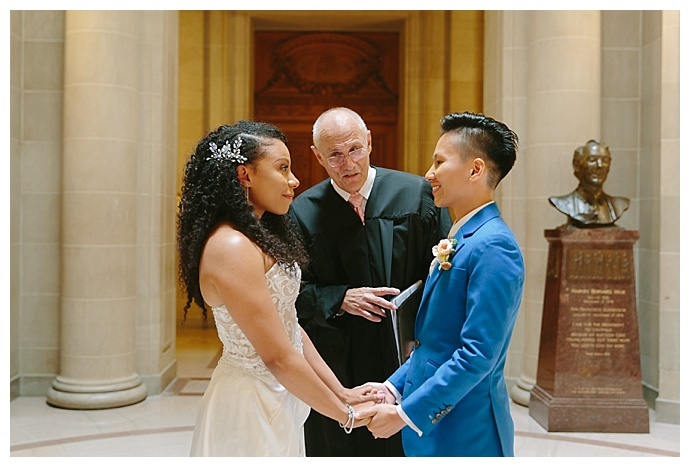 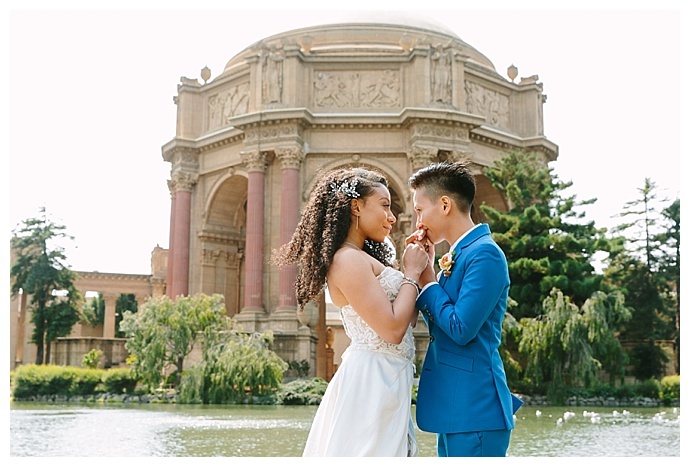 A special place for both brides, Shalita and Sabrina were drawn to the charming hills of San Francisco and couldn’t think of a better place to declare their love for each other than the city with one of the largest LGBTQ communities in the world. 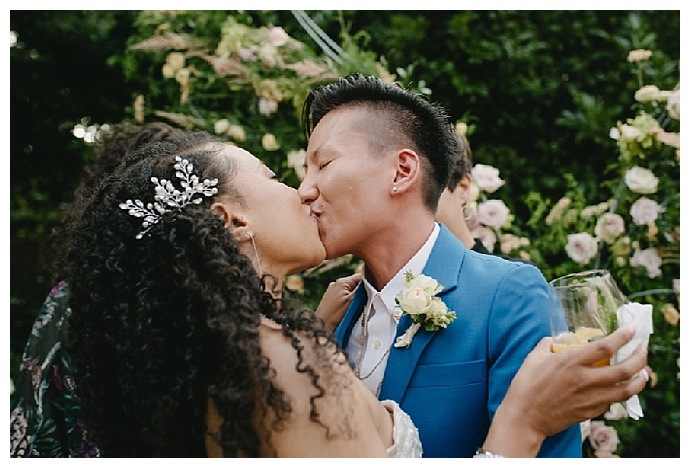 With their wedding bands secure on their ring fingers and a new prefix of Mrs. added to their names, the newlyweds and their guests piled into Mercedes Sprinter vans and headed south, winding along the Bay’s coast to Paolo Alto. 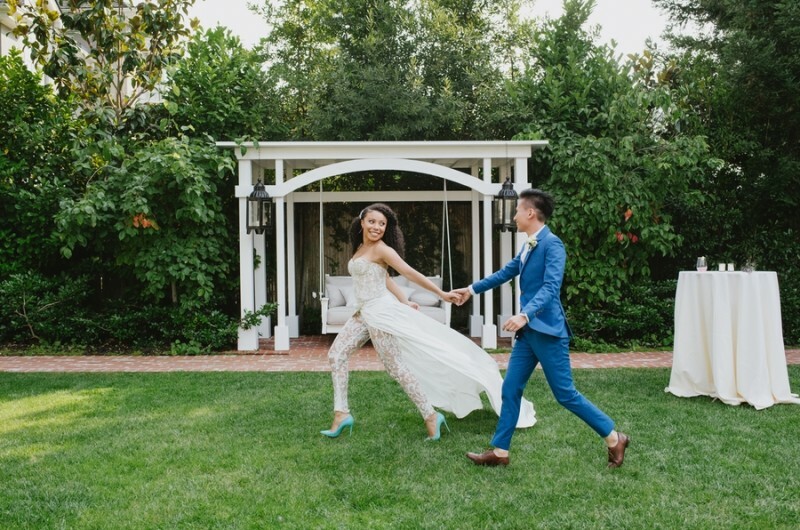 Their reception was held at one of the city’s former Mayor’s homes, a gem of a venue where a manicured lawn and lush garden with sprawling flowers greeted them. 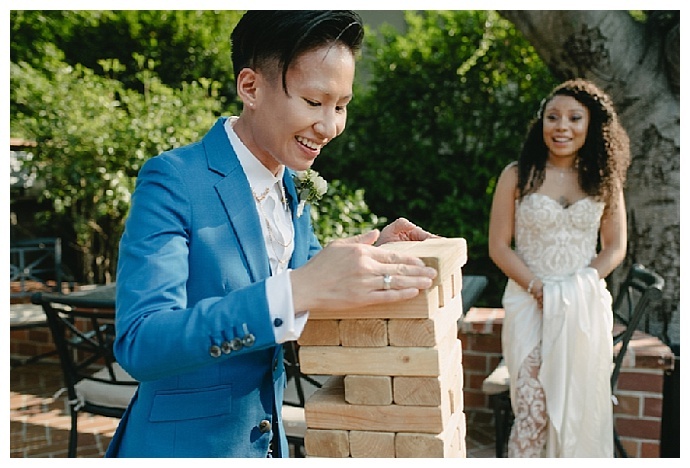 The inviting outdoor space provided an intimate setting for their non-traditional reception, which took on the feel of a casual hangout with close friends where corn hole, giant sized games of Connect Four and Jenga sparked an evening filled with laughter. 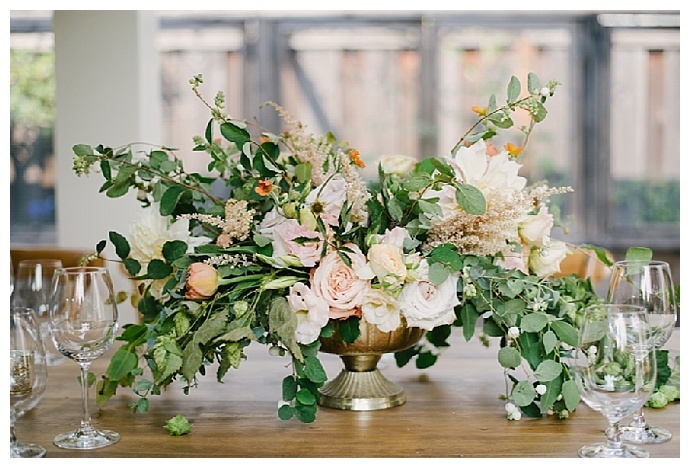 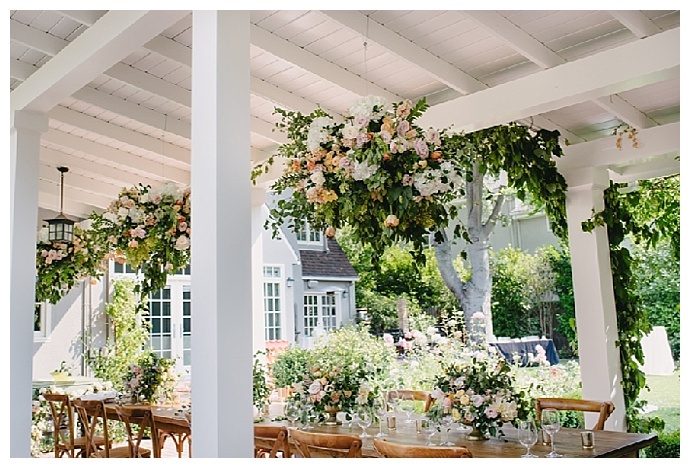 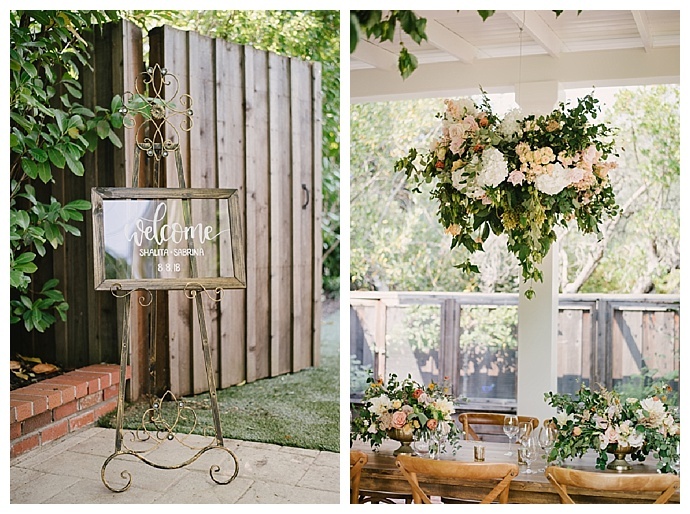 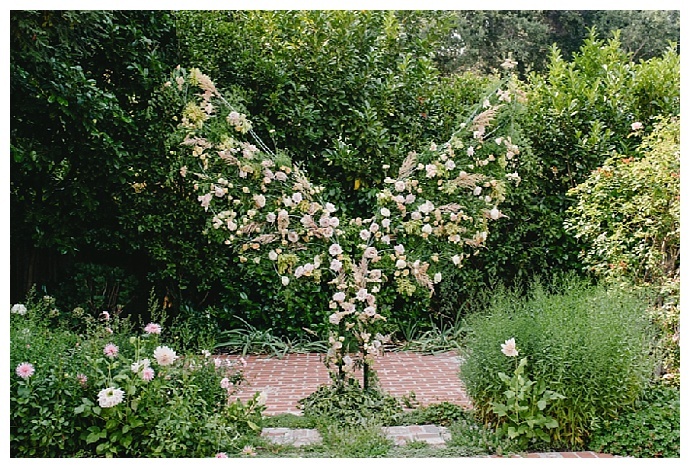 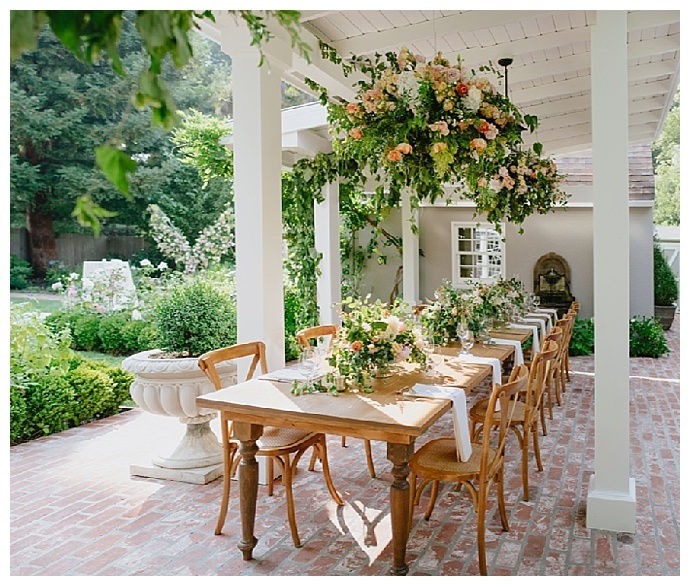 Nestled in a cozy covered area in the backyard, the same pale pink, orange and white blooms sprinkled between lush greenery starred in the arrangements that hung above and lined the farm table that was set for intimate party of 15. 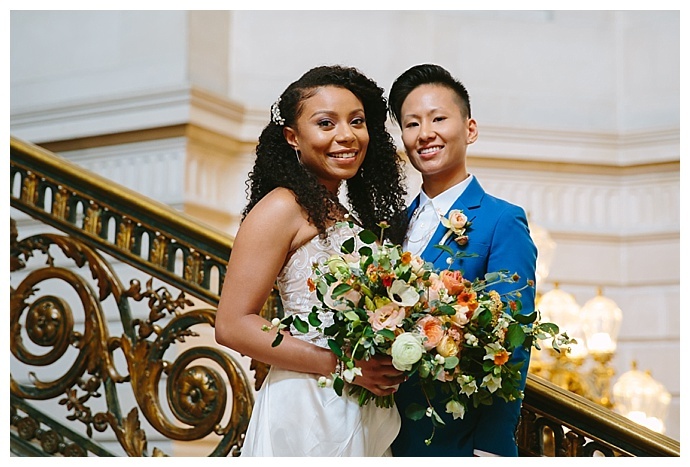 “We hired Chef Francis Ang and his wife Dian of Pinoy Heritage to create a Southeast Asian and Pacific Islander-inspired five-course plated dinner as well as passed hors d’oeuvres,” Shalita and Sabrina say. 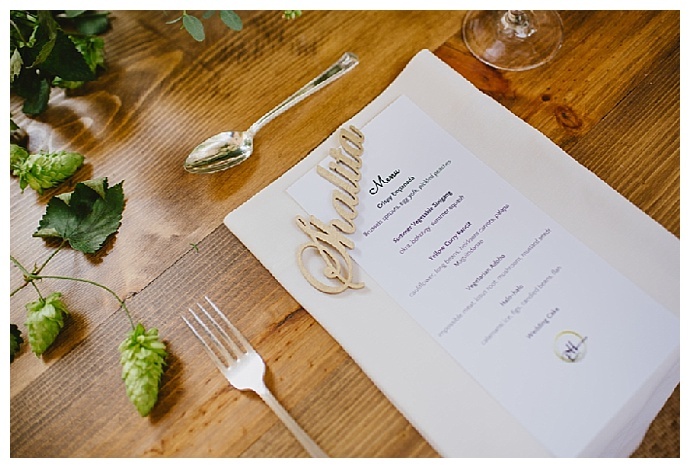 The chefs prepared crispy chorizo empanadas, black cod sinigang, pancit with mussels and shrimp and pork belly adobo, which everyone raved about.